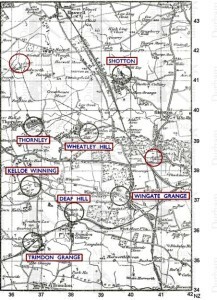 Map of the collieries, most of which Edward Cain worked in at different stages in his life. Edward Cain’s memoir is based on a tape-recording of Edward talking about his life. The memoir gives an insight to the working class life of a North East England family. In a way, the purpose of the memoir could be to educate as Cain offers detail about the Labour Party and the clashes between the trade unionists, workers and colliery owners during his lifetime. The author touches on sensitive subjects from his past such as his father’s relationship with alcohol and violent behaviour around the family. The idea of an audience didn’t seem to determine what aspects of Cain’s life he shared. However, there is a lack of detail about his own family in later life, which may have been because they were still alive when the memoir was published (whereas most of his birth family had passed away) or that he was not comfortable discussing it in his memoir. His wife is only briefly mentioned once, when he says that he moved out of his family home to live with her and her parents who were salvationists (pg 5). Although he goes into a lot of detail about his family when he was younger, the lack of information about his wife may be due to it having no real relevance to the theme of the memoir, which ultimately was about mining life and what it was like to grow up in a mining family. The way the memoir was written suggests that it was created towards Cain’s later life as he explain that his last date of work was in 1966 and he was awarded an MBE was in 1967 (making Edward Cain 75 years old at this time). Cain died later in 1974, at age 83.